Last weekend I exported the first full version of DEBT. It’s a “rough cut,” the first draft assembly of a movie. So what does that really mean? For me, it meant a full edit of the picture and dialogue, some actual music in places, some temp music in places (which is music taken from other sources that we don’t intend to use in the final version), very few sound effects and no visual effects or color correction. It was really the most bare bones version of the story you can throw up on a screen and actually watch start to finish. I explained it as ‘Bambi on ice’ - up on it’s legs, wobbly and not very secure, but a foundation by which to see the whole thing together. That may not be true for every editor, but that’s been my process. I screened this draft in front of a couple producers and the lead cast of the movie. There’s something about seeing a story from beginning to end with an audience. Scenes that feel very strong on their own can drag or even seem completely unnecessary in context with other sequences around it. Items that seem to make sense cease to do so. Additionally - and I’ve heard editors/directors say this as well and I can’t explain it - when you are watching the movie with other people, you notice things you otherwise wouldn’t. Pacing issues become apparent where they weren’t before, you can feel the saggy parts of the edit in a way that you can’t when watching by yourself. It’s a very strange phenomenon but it seems to work out that way every time. We also had a kind of “focus group” after the film. I asked everyone to take notes as it went and afterwards we discussed for at least an hour. That type of feedback is invaluable and brought to light some things I’d never thought of previously. So you screened a rough cut...that means it’s almost done, right? Sort of? Maybe? It’s possible? Not even close? There are also several other key steps that can be very time consuming. ADR, or “Automated Dialogue Replacement” (sometimes called “Additional Dialogue Recording” or “Looping”), is the process of recording lines of dialogue that either were not captured cleanly during filming or need to be changed. And that includes grunts, groans and other action sounds you’d hear in a fight scene (check out Hugh Jackman here and then feel like you want to run through a wall). This is much more common than people probably expect - on some big-budget Hollywood films 60% or more of the dialogue is recorded after the fact. We most likely will not do that much, but it’s still a fair amount and time consuming. Then there’s actual sound design - adding sound effects and mixing the dialogue to the environment. There’s also the music scoring, which our producer Jeff Giroux has been working on and includes both composing original music and finding/selecting preexisting sources for the soundtrack. There’s visual effects - of which we don’t have a ton in the movie but there are some, especially in the fight scenes. And finally there’s color correction and grading, which is adjusting the specific color and exposure qualities of the image, scene by scene. So despite a lot of the postproduction process being in the rearview, there is still a great deal of work remaining. 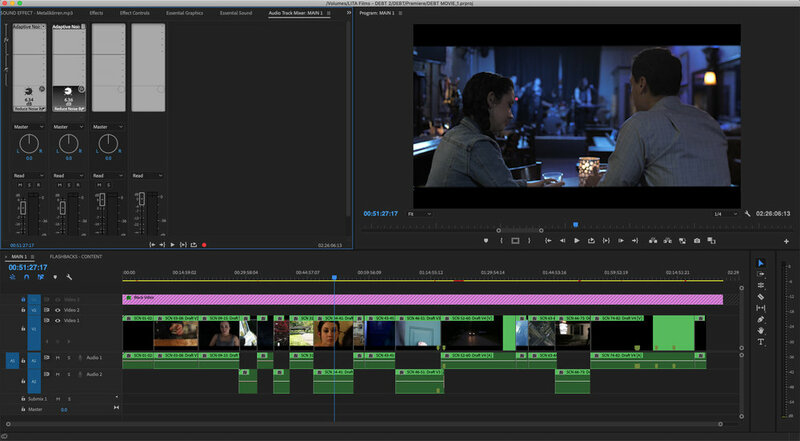 But each milestone like the rough cut moves the film a little bit closer to finally publishing for others to see.